For the past several posts, I diverted from my series of “old” images over the past couple weeks to write a couple Fall Foliage – specific posts, and to self-aggrandize with my two eBooks covering Vermont and the Michigan “U.P.,” the two best fall foliage locations in the U.S. (in my ever-so-humble opinion 🙂 ). I will return to the foregoing series for a few more posts, though I am rapidly approaching the point where I began regular postings here and I don’t plan to “bore” you with “re-runs.” It will have to come to a logical end, soon, and then I will actually have to think of something new and creative to post about :-). Fittingly, the next couple posts have a substantial connection with Vermont and foliage, so the “theme” will continue into foliage season. For some time I had been regaling Rich with stories about the utopian Vermont fall foliage. I had many memories from the years I lived there. With its high percentage of Maples, and its mountainous territory, when things turn in New England, they really turn and present some truly spectacular color shows. While we were on our brief spring trip to the Michigan UP, we agreed it was finally time for Rich to visit Vermont. My last trip to Vermont had been some 20 years ago and I was pretty excited to show Rich the “stomping grounds” of my youth, and really the birthplace of my own photography obsession. So we planned our trip. Traditionally, fall color “happens” in Vermont any time from the last 2 weeks in September to through the first 2 weeks in October. It typically progresses from north to south and from the high mountains down to the valleys. But that is a generalization, I have learned, from my own empirical experience. There are pockets of the state where foliage happens out of sync. I have always found good color in Peacham in the “Northeast Kingdom” of Vermont – sometimes getting there late and sometimes early. The Village of Barton seems to share that character. On the other hand, there are parts of Southern Vermont that seem to always peak in September. Unfortunately, I have missed it every time I have visited those locations. We used my aunt and uncle’s (H.T. Doane) farm in the northwestern part of the state as our home base for this trip. My uncle’s advice was to come the last week of September. In his lifetime of experience, that was our best percentage chance to see “the good stuff.” My aunt and uncle were very generous people and I was always welcome (as were many other visitors over the years) to a bed, food and whatever other hospitality they could offer. I had first lived on the farm in the 1980’s where I spent summers working. I was anxious to go back and excited about the process of photographing the New England Color. I spent a lot of time researching and one of the things I found was there was no really good resource for photographers. During this (and every other) trip, I kept careful notes, and later recorded the information I gathered. This eventually resulted in my eBook, “Photographing Vermont’s Fall Foliage.” I digress, I know, but I cannot pass up an opportunity for yet another blatant plug for my own wonderful writing :-). Disappointingly, from a fall-foliage standpoint, this trip was close to a complete bust. The magical color I remembered from earlier years just never happened in 2005. As we drove through upstate New York and into Vermont, my heart sunk. All I could see was green everywhere I looked. During our week long stay, we drove all over the state to find color. 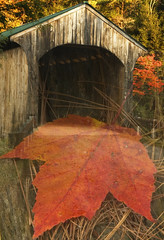 We started in Montgomery, seeking covered bridges and waterfalls, hopefully surrounded by brilliant fall foliage. Not to be. As you can see from the images, there was very little color and where there was, it tended to be Sumac bushes. But we made the most of what we had. My research had unearthed the Arnold John Kaplan pamphlet that is referenced in my eBook and often elsewhere on this site. This pamphlet was to become my primary research tool and the basis for the later eBook (with foreword graciously written by the late Arnold John Kaplan himself). There were a handful of “iconic” scenes that Arnold had famously photographed many years ago and I wanted to visit them. So, we set off looking for Peacham, Waits River, East Orange, East Corinth, and others. We didn’t make it to all, but we did see many. And, pretty uniformly, there was really no color :-(. We did find a hint of color (which I have been able to “tease” out in post-processing) at Peacham, and you can see it was trying to start in Waits River. The other thing we found was what I note in the beginning of the Photographing Vermont eBook: One constant about nature is that it is constantly changing. We found the back road up the mountain that would give us the near aerial shot of East Orange. But we didn’t see the iconic shot. A passing local noted that over the 20 years since Arnold had photographed it, it had all grown up (meaning trees). I didn’t bring anything home that I though was worthy of display from East Orange in 2005, but I did return in 2006 and found an opening (partly because the foliage was mostly gone by the time I arrived) which gave me a pretty nice photo. We also visited the famous ski resort/tennis resort/tourist-destination of Stowe, and spent a day in and around Burlington, Vermont’s major city and university town. The Old Red Mill (now a shop) is in Jericho, on the way to Burlington from the north, and we made it a morning destination. Basically giving up on the foliage images, we knew this would be photogenic with or without colored foliage. This is a tough shot as you have to negotiate a very busy road (full of commuter traffic), and scramble over a bridge on around on a steep, rocky embankment to set up for the shot. The light was pretty hot by the time it was high enough to light the scene, but we were generally pleased with the resulting images. Stowe is a short distance from the farm and is at the southern base of perhaps the most dramatic mountain (“notch”) roads in New England, passing over Mount Mansfield; Vermont’s tallest peak. “Smuggler’s Notch” is, from Bakersfield, the shortest way South. It unfortunately or fortunately – depending on your mission and point of view — also goes through Stowe, which can be a traffic nightmare in high tourist season. Nonetheless, we found ourselves traveling through it almost daily. We stopped for mid-day meals and occasionally dinner after the sun had set. We learned a bit about the place, including that there was a “high view” shot of downtown Stowe. Like so many of these, the shot we saw had been taken years back and new growth had all but blocked any view. We found a trail that was very primitive and basically “bushwacked” our way down to a possible view late one night, guided by flashlight. Believing it had potential, we arrived at dawn the next morning and schlepped our equipment down to the cleared plateau we had found. Daylight came shrouded in a heavy fog that promised to be slow to lift. We patiently waited for about an hour and a half as coffee got cold. While waiting, an inspiration from a year ago (perhaps fueled by boredom) came to me and I started searching the ground for “leaf compositions.” This leaf image and the covered bridge we photographed one morning while staying close to the farm, were combined later in Photoshop and became the official “logo” for LightCentric Photography (see the opening image). Eventually, we gave up and sought breakfast. During breakfast, the sun finally broke through. It was late enough in the year that we figured we still had some time before the light became untenable. So with renewed energy, we decided to return to our spot and though it is difficult to find an area that is not blocked, the photo here is my best image of the Stowe Village (and yes, there has been some retouching 🙂 ). As we prepared for the long return drive to Michigan, we decided the last morning to stick close to the farm. Waterville, only about 15 miles away (a very short distance in Vermont terms) has several covered bridges that are kind of hidden away. We decided to start there on our last morning. The lone tree with muted orange color in the resulting image is illustrative of our frustration. But this image ultimately served as the primary image for my logo. I would continue to return to Vermont every couple falls, and great foliage would continue to evade me. But eventually, I found some and some years, spectacular results.